Singer Camila Cabello looked simple, yet, stylish as she was photographed at 106.1 KISS FM's Jingle Ball 2015 on December 1, 2015. The 18-year-old decided to wear a black and white ensemble that consisted of leather leggings and a chic tunic. 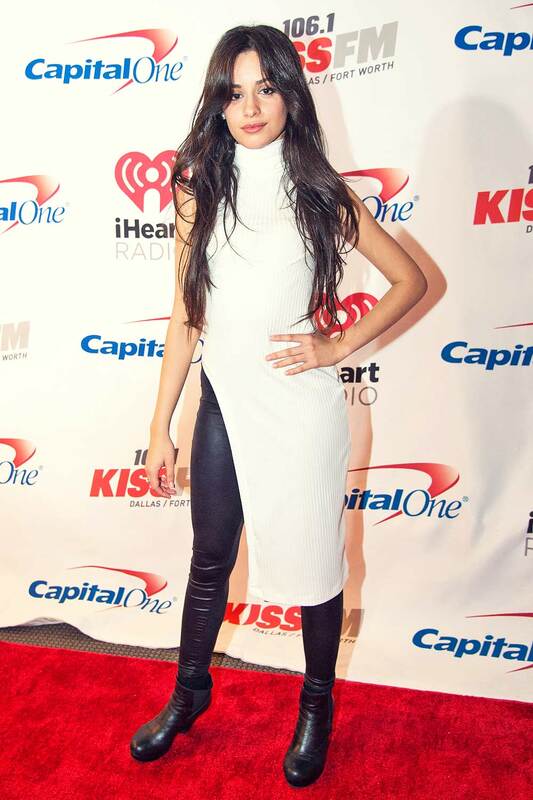 Camila put her slim figure on display in black leather leggings that she teamed with a super stylish white side split tunic. She slipped her feet into a pair of black leather ankle length boots that gave her look an added edge, while stylish stud earrings and ring accessorised her look. Camila kept her look really simple, opting not to wear much accessories. She was wearing her dark tresses over her shoulders in soft curls, while she sported a pink palette of makeup, finishing out the look with few swipe of eyeliner and mascara, plenty of pink blush and a slick of pink lipstick.